On Tuesday 31 July in Vineburgh Community Centre. Irvine Seniors Forum launches their new website. Funded by a community grant from GSK and produced by Robb Wallace Media. 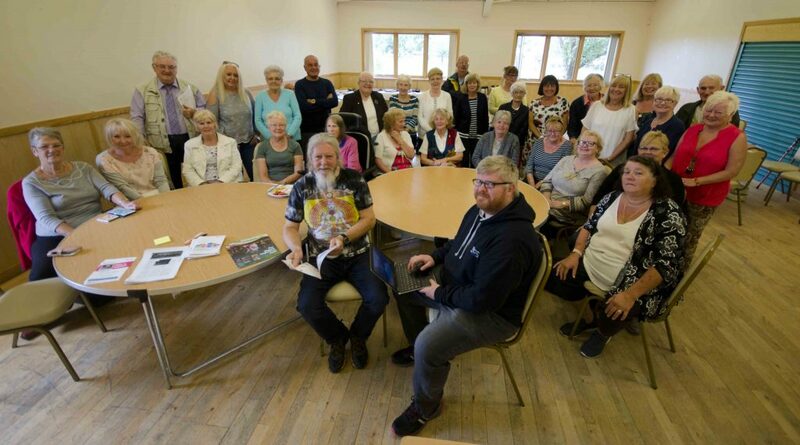 Members of the senior’s forum and other members of community groups heard from Robb Wallace about the main features of the website and how to maintain it. Robb emphasised the point that it was important to get content, all of the people in the room he said, had stories to tell, stories about what their groups did, issues that affect senior citizens. The website can share their stories. Before sitting down to a buffet lunch the audience were asked to write down any suggestions that they would like to see on the website After lunch the meeting heard from Dorothy Murray from the Scottish Seniors Alliance, She gave a brief history of the alliance from the days of the Strathclyde elderly forum to the present day. She contrasted the fact that in the past the Strathclyde elderly forum had 6 community workers today SSA has one admin officer, Funding was a major problem. The SSA has been instrumental with other national groups in arguing for the Scottish parliament to set up a seniors parliament something we are still fighting for. We have been successful in moving the parliament to have a minister with responsibility for older people. She thanked the Seniors forum for their support reminding them that Ian Wallace (Irvine seniors ) was on the executive committee. She closed her remarks by congratulating the forum on the production of the website highlighting the input from Robb. Cllr Jimmy Miller North Ayrshire Councils older peoples champion congratulated the forum for organising the event, he was sure that as the website developed it would be a useful tool for senior citizens in Irvine and North Ayrshire. He told the audience that his commitment as a councillor an older people’s champion was to take up our issues and present them to the council. Closing the meeting Ian Wallace secretary of the forum thanked the audience for their support and attendance, Robb for producing the website and reminded them that content was king and asked them to send in news, views and issues he said that there were many issues facing senior citizens and with over 90000 over the 50s in north Ayrshire together we can work for change, we owe it to the younger people who could be working till they are seventy with no prospect of a pension. We may be classed as old people but older people contribute up to 50 billion a year to the national economy. The next meeting of the senior’s forum will be in the Woodlands Centre 1-30 to 3-30 on 28th August all welcome.